Do Unions Advocate for the Greater Good? While unions may be rather powerless to affect taxation, they may be able to influence where the tax revenues go. 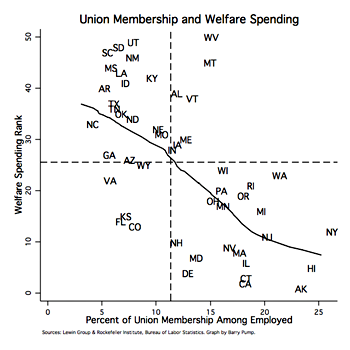 Unions generally support social welfare spending and a strong safety net, so greater union membership would result in more social welfare spending….It seems, based on the data above, that unions probably spend more time trying to influence where the taxes states do get ultimately go rather than from whom states receive that tax revenue. Now, there’s no telling if there’s really any causation here. It could be that states with progressive politics simply tend to produce both strong union movements and higher social spending. But this is something that would be worth a followup. One of the arguments in favor of organized labor is that they advocate for broad social change even on issues that don’t directly affect union members. (For example, national healthcare and high minimum wages. These don’t really affect union members much since they’ve already negotiated health coverage and wages far higher than the minimum, but unions have consistently fought for them anyway.) This behavior is actually a little mysterious, since interest groups usually stick to fairly narrow parochial concerns, but there’s a pretty broad consensus that unions have always acted this way, both in the U.S. and Europe. If Pump’s correlation holds up, it’s another piece of evidence that unions really do tend to produce more egalitarian social policies in general, not just policies that favor union members.